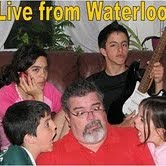 Live from Waterloo: Epic win! We had a game with Santi’s team (the Panthers) in Owen Sound on Saturday. In order to get there, we had to drive through Durham, where a tornado hit last Thursday, even causing the death of an 11 year-old little boy. The images were impressive (I will post some pictures on Wednesday and Thursday) and there was a big delay on the highway, so we were late for the game. We were 3-1 ahead with 10 minutes to go, but we ran out of steam and Owen Sound grabbed an undeserved win, that could have even been a victory, if it hadn’t been for Aaron, our star defender (a great player and more importantly, a fantastic kid) who had a heart-stopping clear with just 1’ to go. We came back home exhausted (both of us) and hurt (just Santi). We ate on our way back (a ‘lunch-dinner’ at 6:00 PM) and I went straight to bed. Then the phone rings at around 10:00 PM. It was Robert, coach of the U15 “B” team, for which Santi had played two years ago while I was in Colombia, after a glorious performance with his “A” team (as a call up). – Gabriel, I need a favour… We have a game tomorrow and I’m short of players due to injury, suspension, religion (it’s Ramadan), etc. Could Santi play for us tomorrow? – Mmm… Let me see, Santi was limping after the game and he was very tired, so I’m going to ask him. I do know, however, that the moment I tell him it’s for your team he will say ‘yes’ (Robert is one of the most respected and appreciated coaches in Waterloo). I went downstairs and asked Santi, getting the obvious ‘yes’ as a reply. Then Robert asked me if I could get a second player. It seemed crazy, but Santi was just texting with Aaron, so we asked him, and he also said yes. I called Robert again. – Robert, I got you a second player. His name is Aaron and he normally plays left back. He can run the 90’ without a problem and believe me, he won’t disappoint you. – Perfect! Come over my place at 8:45 tomorrow, and then I take the kids to Windsor. It’s a key game, we play against a team that is currently in first position; they beat us 4-2 in Waterloo today, after we were 2-0 at halftime. There were some problems, a couple of red cards… tomorrow’s going to be a ‘hot’ game. Windsor is 300 km away from Waterloo… Anybody would think that it could be an obstacle for either me or ‘my’ players. – Perfect. We’ll meet there and then we leave together. – What, you’re going to drive down??!!! – Of course! How could I miss it? And away we went. We arrived in Windsor at noon and went to the Little Italy district for lunch. Robert invited us, as a token of appreciation. We then had a coffee and went to the game. Robert was kind enough to ask me to sit by him on the bench, which I greatly appreciated. I haven’t enjoyed a victory this much in a lot of time, and it even wasn’t my team! Aaron played all 90 minutes and was simply brilliant. Santi came in 14 minutes into the first half and stayed until 5 minutes before the game ended. Both made me look really good! We were losing 1-0 at half time, but Waterloo just ran over their opponents in the second half. ‘We’ tied the game with a wonderful shot from outside the box and that’s when I started to see Santi grow in the midfield (he played outside left midfielder most of the game). He was challenging, fighting and winning balls high and low, in spite of the obvious differences in size. He made a couple of millimetric passes to our forwards that didn’t end in goals by miracle, and soon he started to be the target of many fouls. In one of those he fell hard and was grabbing his right arm afterwards. “He took a dive!” I said, but I was wrong, because he couldn’t move his arm after the game. He kept playing, though, even using his arm when doing throws. With just seven minutes to go, Santi moves up and is taken down just outside the box. Yellow card and free kick. It’s taken and Sant and another kid go for the header. Both fail, but the other kid (Ben) hits the ball with the shoulder and puts it far from the keeper’s reach to establish the 2-1. Boy, did we celebrate that one!!! The end of the game found our occasional rivals very frustrated and resorting to violence. They saw three yellow cards, and the coach was sent off, which tells you from whom they learned to play that way. Robert, in the meantime, was showing the education and composure that you can expect of him, asking his players not to get carried away and engaging into those verbal battles. One of the refs told me after the game ended “Your coach has more class on the nail of his pinkie toe than that entire coaching team”. I fully agreed, though such a comments was interesting… because the referee was from Windsor! We returned home very happy, and Robert and the players invited our guys to have dinner with them, which shows you once again the kind of people we were dealing with. Robert himself had very nice words with my players and gave them some well appreciated advice. He also invited them for the team’s next game in Sarnia, next Saturday. They will be there, of course. They were exceptionally welcomed by their occasional teammates, to the point that Santi told me “I have never felt more comfortable playing with guys I barely know”. I left them making calculations, and with the satisfaction of having assisted to a class on how to play –and more importantly for me, how to coach– a soccer game. UPDATE: (3:00 PM) I’m just back from the clinic. Santi has a broken bone in his right wrist, so he got a cast. He’s very upset, but we still don’t know if that cast is going to stay, at least until we see a specialist. That he ended playing with a broken bone just adds more to his character, don’t you think? Parecería que quiero apropiarme de la frase hecha famosa por el Fail! blog, pero no es así, la de ayer fue una victoria épica en serio. Tuvimos partido con el equipo de Santiago (los Panthers) el sábado por la tarde en Owen Sound. Para llegar allí tuvimos que pasar por Durnham, donde un tornado arreció la semana pasada, incluso causando la muerte de un chiquito de 11 años. Las imágenes fueron impactantes (postearé algunas el miércoles y jueves), y había una gran demora en la ruta, por lo que llegamos muy tarde al partido. Veníamos ganando 3-1, pero nos ‘quedamos sin combustible’ y Owen Sound alcanzó un inmerecido empate, que hasta podría haber sido victoria si no hubera sido por una providencial salvada de Aaron, nuestro defensor estrella (un excelente jugador, y más importante aún, un chico fantástico). Volvimos a casa agotados (ambos) y muy golpeados (sólo Santi). Comimos en el camino (un ‘almuerzo-cena’ a las 6:00 PM) y yo me fui derechito a la cama. A eso de las 10:00 PM suena el teléfono. Era Robert, técnico del equipo U15 “B”, equipo para el que Santi ya había jugado mientras yo estaba en Colombia, después de una gloriosa performance con el equipo “A” de su misma edad. – Gabriel, necesito un favor… Tenemos un partido mañana y me faltan jugadores por lesión, suspensión, motivos religiosos (es Ramadán), etc. Podrá jugar Santi mañana? – Mmm… Dejame ver, Santi terminó rengueando y muy cansado, así que le voy a preguntar. De todos modos, cuando le diga que es para tu equipo, seguro que dice que sí (Robert es uno de los coaches más respetados y apreciados en Waterloo). Fui abajo y le pregunté, con el obvio ‘sí’ como respuesta. Entonces Robert me preguntó si podía conseguir algún otro jugador. Parecía una locura, pero Santi justo estaba chateando con Aaron, así que le preguntamos y sí, podía jugar. Volví a llamar a Robert. – Robert, te conseguí otro jugador. Se llama Aaron y juega de defensor, normalmente por la izquierda. Puede correr los 90’ sin inconvenientes y creéme, no te va a defraudar. – Perfecto! Venite a mi casa mañana a las 8:45, que de ahí salgo para Windsor con los chicos. Es un partido crítico, jugamos contra el equipo que está primero en la liga, y que hoy nos ganó 4-2 en Waterloo luego de que estuviésemos 2-0 arriba. Hubo algunos incidentes, tarjetas rojas, este va a ser un partido muy ‘caliente’. Windsor queda a 300 km de Waterloo… Cualquiera pensaría que eso sería un obstáculo para mí o ‘mis’ jugadores. – Perfecto. Nos encontramos allí y salimos en caravana. – Cómo, vos vas a venir también??!!! – Claro! Cómo me lo voy a perder? Y allí fuimos. Llegamos a Windsor al mediodía, y fuimos todos a comer a la Pequeña Italia de Windsor. Robert pagó por todos, como agradecimiento a mis esfuerzos por conseguirle jugadores. Después tomamos un café y nos fuimos al partido. Fue la victoria que más haya disfrutado en muchísimo tiempo, y ni siquiera era mi equipo!! Aaron jugó los 90 minutos y lo hizo de manera sencillamente brillante. Santi entró a los 14 del primer tiempo y no volvió a salir hasta faltando cinco minutos para terminar. Ambos me hicieron quedar muy bien con Robert. Ibamos perdiendo 1-0 en el entretiempo y en el segundo tiempo Waterloo los pasó por encima. ‘Empatamos’ con un brillante gol de volea desde afuera del área y allí fue que comencé a ver a Santi crecer en el medio campo (jugó de volante por la izquierda). Trababa, peleaba y ganaba pelotas por alto y bajo, a pesar de la obvia diferencia de tamaño. Hizo un par de pases milimétricos que por milagro no terminaron en gol, y pronto los jugadores rivales comenzaron a golpearlo. En uno de esos fouls cayó pesadamente y se tomaba el brazo derecho. “Se tiró!” dije yo, pero evidentemente me había equivocado, porque no podía mover su brazo luego del partido. Faltando sólo 7 minutos, Santi que se manda por la izquierda otra vez y es derribado afuera del área. Tarjeta amarilla y tiro libre. Lo ejecutan y Santi y otro jugador van a buscar el cabezazo. Ambos fallan, pero el otro chico (Ben) le pega con el hombro y la manda por encima del arquero para poner el 2-1. Cómo gritamos!!! El final del partido encontró al equipo rival frustrado y apelando a la violencia. Tres jugadores fueron amonestados y el coach fue expulsado, lo que da la pauta de cómo es que este equipo juega así. Robert mientras tanto mostraba la educación y compostura de siempre, pidiéndole a sus jugadores que no se ‘engancharan’ en esas batallas verbales. Al final del partido uno de los referees me dijo “tu coach tiene más clase en la uña del dedo chiquito del pie que todo el grupo técnico del otro equipo”. Completamente de acuerdo, pero muy interesante comentario… porque ese referee era de Windsor! Volvimos muy contentos y Robert y los jugadores nos invitaron a cenar a su casa, lo que da una pauta más de la clase de gente que son. El tuvo muchas palabras y muy elogiosas para mis jugadores, y también los invitó al próximo partido, este sábado en Sarnia. Allí estarán, por supuesto. Por qué fue épica la victoria? Bueno, jugaron en inferioridad de condiciones con el equipo más fuerte de la liga. Tuvieron tres jugadores invitados, que jugaron de manera descomunal. Algunos jugadores (incluidos los míos) estaban lastimados y siguieron en la cancha. Así y todo, se llevaron al otro equipo por delante, y le ganaron ‘a lo macho’. Los dejé sacando cuentas y me fui con la satisfacción de haber visto una clase de cómo jugar –y lo más importante para mí, cómo dirigir– un partido de fútbol. UPDATE: (3:00 PM) Acabo de volver de la clinica. Santi tiene un hueso roto en su muñeca derecha, por lo que lo enyesaron. Está muy deprimido, pero no sabemos por cuánto va a tener que llevar el yeso, al menos hasta que hablemos con el especialista. De todos modos, que haya terminado el partido con un hueso roto habla mucho acerca de su carácter, no creen? Menos mal que los fanáticos estamos por estos lares!! Uhh, pobre Santi, no va a poder jugar por unas semanas, no? Que buen relato el del partido, lástima los golpes.